Participants at the Train-the-Trainers session held in July 2012, L-R: Bev Jacobs; Barbara Barker (back); Elder Lois Rullin, Haida Nation (front); Mavis Erickson; Cherlyn Billy; Melissa Hyland (back); Katrina Harry. Participants not in this photo were: Marilyn George, Belinda Lacombe, Rhaea Bailey and Gail Edinger. The Indigenous Communities Safety Project (ICSP) provides knowledge sharing to Aboriginal leadership (including governance leadership, service providers and the natural leadership) in Aboriginal communities (First Nations and urban Aboriginal communities) related to criminal justice, family justice and child protection laws, policies and practices that directly affect police and government responses to domestic and sexual violence, child abuse and neglect. The purpose of the project is to empower Aboriginal service providers to assist Aboriginal communities – and especially women and children – to become safer, to be aware of their legal rights, to understand the lethal risk factors and to access services and the justice system if they become victimized. We will also work to foster connections and relations between Aboriginal leadership and service providers with anti-violence service providers in the regions. 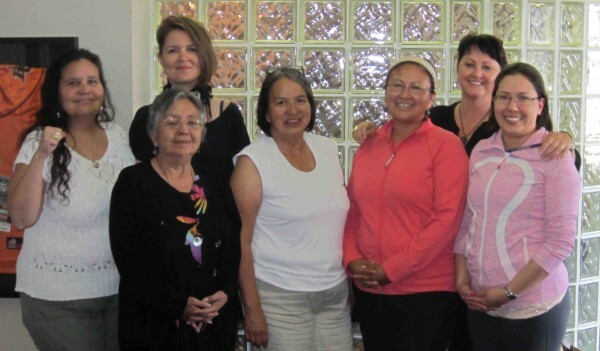 In the first year of the project, we developed promotional materials; sought approval from Aboriginal leadership at the provincial level, informed Aboriginal communities about this project and sought their leadership approval, encouraged communities to self-identify to participate; developed curriculum, training materials and an evaluation plan; identified communities that would receive the training; recruited and trained the trainers and legal advocates; and organized the training workshops. In the second year of the project, community assessments were conducted to determine how best to meet the needs of specific communities. Two mobile Aboriginal training teams made up of a public legal educator and a violence against women advocate – traveled to 12 Aboriginal communities in BC to provide three days of training to Aboriginal service providers with a goal to assist communities to develop their own safety plans for women. Following the training sessions, the teams provided support to service providers via phone, email, and conference calls. A province-wide video conference to reach 150 rural and remote Aboriginal communities. Encouraged communities to discuss practical ways to improve safety and access to justice for women and children. Helped communities develop community safety plans that will help keep women and children safe from domestic and sexual violence and child abuse and neglect. Empowered Aboriginal communities across the province to respond to violence. Empowered Aboriginal service providers to better assist Aboriginal communities-especially women and children-to keep themselves safe, to be aware of their legal rights and to access justice if they become victims. Raised awareness about law and policy, including relevant aspects of the Criminal Code, the RCMP Primary Aggressor Policy, the provincial Violence Against Women Policy, the High Risk Domestic Violence Protocol and the Child Protection Domestic Violence Guidelines. Equipped Aboriginal communities with the tools they need to identify lethal domestic violence-related risk factors, respond to disclosures and negotiate help. Equipped service providers working in these communities with the knowledge they need to ensure that women and families know their rights and understand the laws and policies that can help keep them safe. Helped improve access to justice by putting information in the hands of the helping community and leadership. Provided an alternative for victims of violence who do not feel comfortable seeking assistance from a non-Aboriginal person or service. Fostered relationships with mainstream legal and justice communities that will encourage cross-sector, cross-culture collaborations in the future. Facilitated the creation of networks that encourage services to work together and encourage women to report domestic and sexual violence to police and access justice and child protection systems. Is the leadership (governance, service providers and natural leaders) supportive in addressing the issues of violence against Aboriginal women? Is the leadership willing to fully participate in a minimum of three days of training? Are there strong partnerships in the community among service providers? Does the community currently have partnerships/make referrals to non-Aboriginal services? How do service providers collaborate now and is there a debriefing process? Are there Elders/Traditional Knowledge Holders who can provide teachings about roles and responsibilities of men and women in community, healthy relationships, healthy sexual relationships? Will your leadership make it possible to implement a community safety plan post-training? What is the protocol for coming into your community? When is the best time of year for this training to come to your community?